If you require your data stores to be highly available, you can install ArcGIS Data Store on another machine, create an additional data store, and register it with the same ArcGIS GIS Server site (your portal's hosting server). Relational data stores—The first machine on which you install ArcGIS Data Store and create a relational data store is the primary relational data store machine. You can install and configure one other relational data store with the same GIS Server site, making this second relational data store machine your standby machine. Hosted feature layer data is replicated from the primary to the standby. If the primary becomes unavailable (for example, if the primary machine crashes, loses power, or loses network connectivity), the standby machine is promoted to primary. You will only be without your hosted feature layer data for the short period of time it takes for the standby machine to become the primary—this can take up to a few minutes. Once the standby becomes the primary relational data store, it sends its backup files to the same location as the former primary machine. If you can correct the problem with the former primary machine—for example, if the machine was unplugged and you plugged it back in, or the machine temporarily lost network connectivity but network connectivity was later restored—the former primary becomes the standby machine for the data store. Tile cache data stores—The first machine on which you install ArcGIS Data Store and create a tile cache data store is the primary tile cache data store machine. You can install and configure one other tile cache data store with the same GIS Server site, making this second tile cache data store machine your standby machine. Hosted scene layer cache data is replicated from the primary to the standby. Similar to relational data stores, the standby becomes primary if the primary machine fails; however, unlike relational data stores, tile cache data stores do not have a mapped network drive for automatic backup files. Spatiotemporal big data stores—You can install ArcGIS Data Store on several different machines, create spatiotemporal big data stores on each, and register each one with the same GIS Server site. 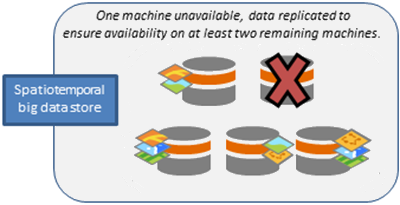 Data in the spatiotemporal big data store is duplicated on at least two spatiotemporal big data store machines registered to the same hosting server. If any one machine fails, data still exists on at least one other machine. The data store replicates the data to another machine that is still functional. The following is a list of situations for which the standby machine becomes the primary for your relational and tile cache data stores. Note that the following three situations involve hardware or software failures. The primary data store stops working. ArcGIS Data Store attempts to restart the data store on the primary machine. If it cannot restart, the data store fails over to the standby. The primary's web app stops running and attempts to restart the web app on the primary machine. In the rare case that this does not work, the data store fails over to the standby machine. The primary machine is unavailable. This can happen if the computer crashes, is unplugged, or loses network connectivity. ArcGIS Data Store makes five attempts to connect to the primary machine. If a connection is not possible after five attempts, the data store fails over to the standby machine. The only human-initiated situations that cause a failover are if the primary data store machine is deliberately taken offline, or the ArcGIS Server site administrator runs the makePrimary REST command on the standby machine. Shutting down an on-premises Windows machine that is serving as the primary ArcGIS Data Store machine does not cause the data store to fail over because Windows shuts down all services before shutting down the machine. Therefore, if you need the data store to be available while that machine is offline, manually promote the standby machine to primary first, and then shut down the former primary ArcGIS Data Store Windows machine. Use the Data Store Configuration wizard or the configuredatastore utility to add a machine to an existing data store. You can have one standby relational data store and one standby tile cache data store. You can have multiple machines in a spatiotemporal big data store, which you add one at a time using either the Data Store Configuration wizard or configuredatastore utility. All machines that participate in the same data store must use the same operating system. Install ArcGIS Data Store on another server. The standby and primary machines (for relational and tile cache data stores) and each node in a spatiotemporal big data store must be installed on different physical servers. Be sure to use the same network account for the ArcGIS Data Store account on all machines in the data store. Open the ArcGIS Data Store Configuration wizard. Specify the URL of the GIS Server site. The URL is in the format https://gisserver.domain.com:6443. Use the same GIS Server site as you did when configuring the primary relational or tile cache data store or the other machines in your spatiotemporal big data store. Type the user name and password of the ArcGIS Server primary site administrator and click Next. Choose the type of data store you want to create. Be sure to choose the same type as is on the data store machine to which you want to add this machine. Specify a location for the new data store's directory and click Next. Review the information in the Configuration Summary. If it is correct, click Finish. If changes are needed, click Back to make corrections. The High Availability Role should show this is a standby machine for tile cache and relational data stores. When the setup completes successfully, you have an additional data store machine to which the primary (for relational and tile cache data stores) or other spatiotemporal data stores can replicate data. If there were errors with the setup, click Next on the Configuration Summary dialog box to reopen the Data Store Configuration wizard so you can provide different information. See Troubleshoot ArcGIS Data Store for causes and resolutions to setup errors. You can install ArcGIS Data Store on another server and use the configuredatastore utility to add it to an existing data store. The utility is installed in <ArcGIS Data Store installation directory>/tools. Open a Command Prompt using the Run As Administrator option on the additional server where you installed ArcGIS Data Store. Run the configuredatastore utility, and provide the GIS Server URL and the ArcGIS Server primary site administrator user name and password. Also use the --stores operation to specify the type of data store to be created. Be sure to specify the same GIS Server URL and data store type as you used for the data store to which you want to add this machine. An additional data store machine is added to your data store, and the primary (for relational and tile cache data stores) or other spatiotemporal data stores can replicate data to this machine.